By WET for City Creek Reserve, Inc. & Taubman Centers, Inc.
With water a distinct and unifying theme throughout the property, WET has designed three magical features varying in scale and style, Engage, Transcend, and Flutter, to draw people, fascinate them, and give them cause to laugh, play and reconnect with their natural surroundings throughout the 20-acre City Creek Center. Situated adjacent to The Church of Jesus Christ of Latter-day Saints’ Salt Lake Temple, the 20-acre development was forged by the church’s real estate division, Property Reserve, Inc., and Taubman Centers, Inc. and includes retail, dining, residential and office spaces, as well as a new Marriott hotel. 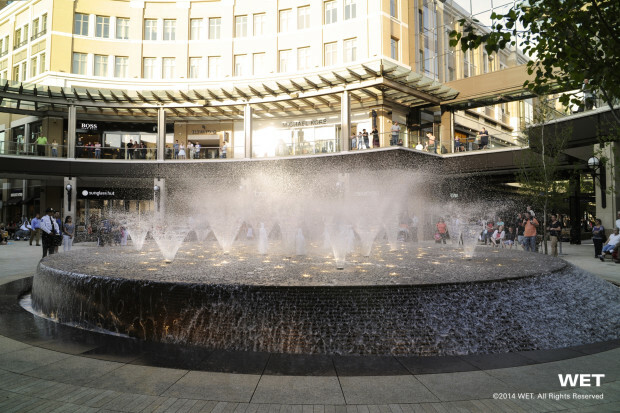 The goal for City Creek Center was to revitalize a once-thriving area of downtown Salt Lake City. 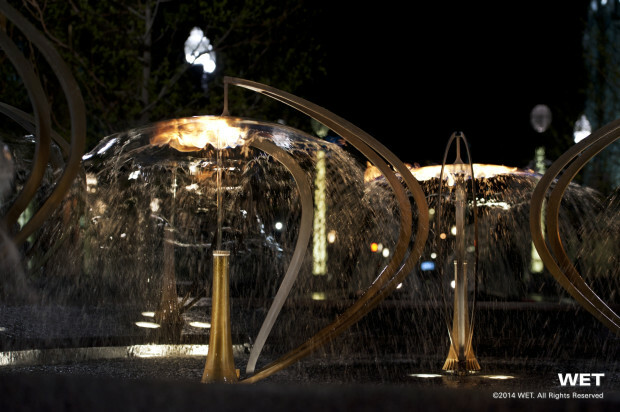 WET achieved this by creating magnetic water features that engage and invite people into their new sustainable urban community development. "Engage" teases with mesmeric waterforms darting in and out of view—and touch. 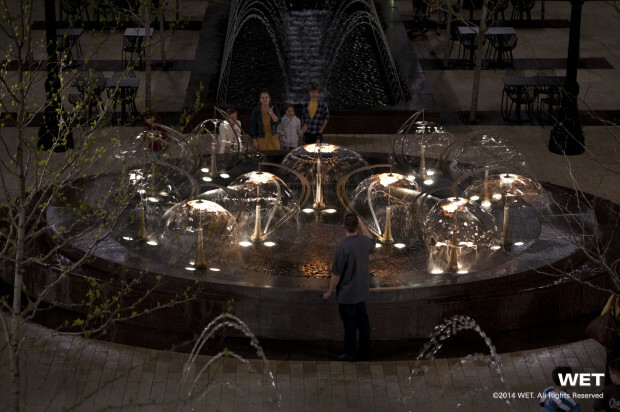 People flank the edges of nearby "Transcend" to warm their hands by the shooting sprays, water that radiates heat as the water itself is “on fire” to enjoy this musical feature during winter. 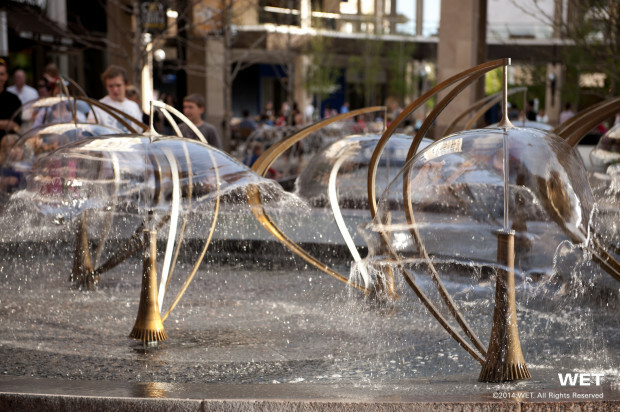 "Flutter", located in the residential area’s courtyard, made of crystalline streams of water transforming themselves into gossamer parasols of glistening water also able to bloom with fire, infusing a warm energy throughout the development. WET employs over two hundred talented individuals, including designers, architects, landscape architects, graphic artists, motion designers, inventors, fluid mechanics engineers, special effects technicians, electrical engineers, choreographers, optical engineers, control system engineers, animators and illustrators. Each project is a true collaboration between all of these talents. WET carries out all aspects of its projects from concept to completion. For the three City Creek features: Mark Fuller, Chief Excellence Officer, nurtured the client’s needs and maintained WET’s collaboratively created design’s vision from concept to completion; Teresa Powell-Caldwell, VP of Business Development, the initial point of contact to the clients whom was another leader in WET and creation of City Creek’s 3 features; Claire Kahn, Principal of Design, whom collaboratively designed City Creeks features with WET's designers. 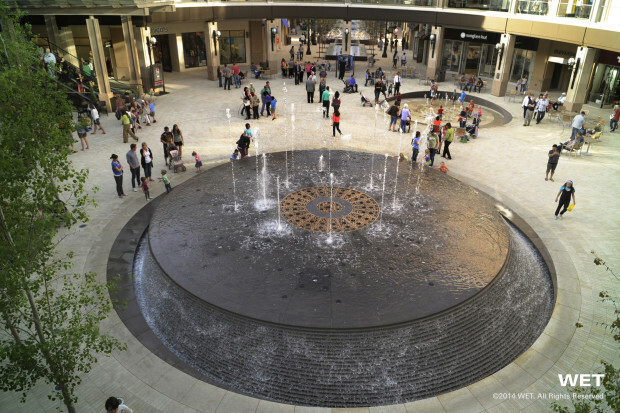 While every new WET feature brings a renewed enthusiasm to the company, Mark also had an especially fond attachment to the features he and his firm have created for City Creek Center as a Salt Lake City native and graduate of the University of Utah. 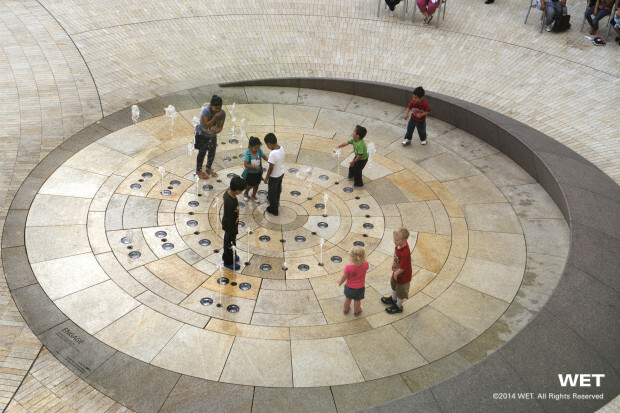 Each feature was in collaboration with architects, ultimately done for Taubman Centers, Inc. and City Creek Reserve, Inc.